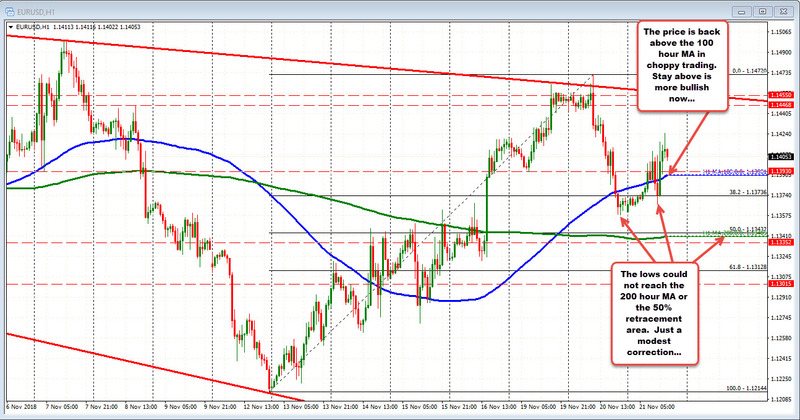 EURUSD choppy but higher. If the dollar is going lower, what do the charts have to tell us? If the dollar has peaked, what do traders want to see? Adam asks a key question at the end of his recent post. "How much will the dollar fall if the Fed hits the pause button on rate hikes?" For me the price action and technicals help tell the story. Today the price action shows a rebound from yesterday's sell off, but the price action on the hourly chart shows choppy up and down trading. What I see technically though is that the fall yesterday took the price below the 100 hour MA (blue line - bearish) and marginally below the 38.2% of the move up from the November 12 low. That level comes in at 1.13736. What did NOT happen yesterday or today is a move below the 200 hour MA (green line) or 50% retracement. That makes the move low more of a modest correction. 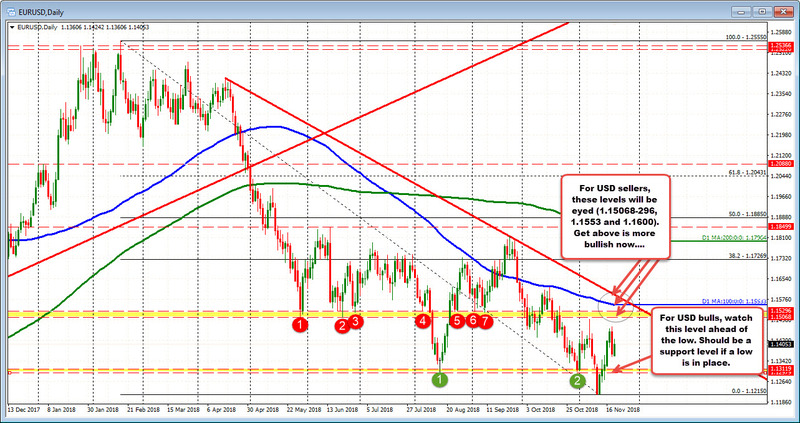 The rebound off that modest correction has taken the price back above the 100 hour MA currently at 1.1390. Watch that level for bullish/bearish clues intraday. Stay above and the dollar selling (higher EURUSD) can be expected. Move below and the choppy run higher tilts more to the bearish side once again (with a move below the 1.13736 level more bearish). So stay above the 100 hour MA allows the dollar to sell off more - technically. Taking a broader look at the daily chart below, what does it say about bullish/bearish and where can a more bearish dollar target? Well, the month's low fell below a floor at 1.1398-12 area (see green circles). That level can be tested before moving higher, and still lead to a more bearish dollar picture. Hence the importance of what the hourly chart says (il.e watch the 100 and 200 hour MAs there). On the topside, if the EURUSD does continue its move higher (lower USD) by staying above the 100 and 200 hour MAs, the 1.1506-296 area (see red circles) has been a swing area and would be the next key upside target area. Move above that area will then target the 100 day MA at 1.1553 (blue line in the chart below - it is moving lower), followed by a downward sloping trend line at 1.1600 currently. Above 1.1600 and the dollar has more room to roam back higher. Of course the story line can change in an instant. If Brexit slows EU growth, if slowing US slows global/EU growth more. If Trump continues to go on a tariff rampage (trade deficits are not getting that much better afterall). If the Fed continues to tighten. All those can keep the dollar bullish. However, the price action will tell the story. So listen to the story by watching the price.